Ticket to Ride gets a 15 minute cab ride; Posthuman Saga Launches! And cult classic dungeon crawler Claustrophobia gets a relaunch. Welcome to the News Brief! I’d chat more but I’ve gotta catch a cab – TAXI! 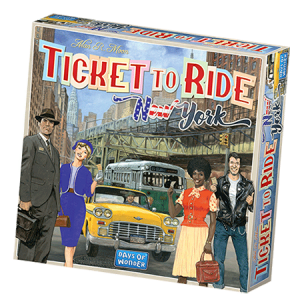 Set in the 1960’s Big Apple, the game now lasts a svelte fifteen minutes as you try to cab from Brooklyn to Central Park. With the longest route set at 4 (Chelsea to Soho), deploy your fleet of taxis to score routes and see the sights. 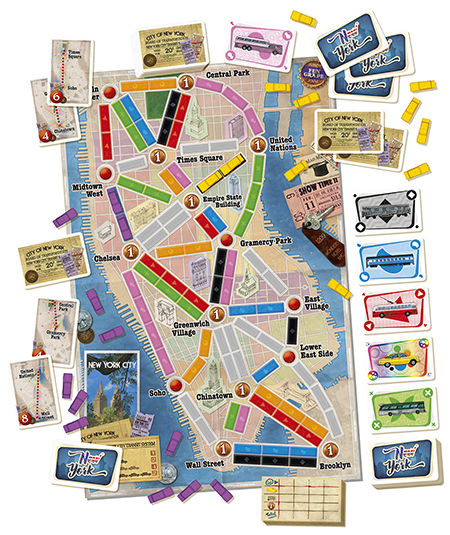 The game will retail at half the MSRP of regular TTR, so be ready to flag it down this July – or check out any of the (many) versions of this classic route building game already on the market, from Scandinavia to India. The future has fallen – but this campaign sure hasn’t! Mighty Boards, the publisher of Posthuman and Vengeance (which we reviewed late last year) has launched their newest title, a eurogame of exploration and survival in a posthuman landscape. Featuring vastly improved components over the first title and a greatly revised… well, everything – the focus this time is on narrative encounters and exploration rather than brute survival and a race against the clock. Gone too is the ability to change sides to the mutants – instead players are competing to complete their mission on behalf of the Stronghold. Check out the Kickstarter campaign here – backers of the first Posthuman will receive a free expansion for that game too. That teaser image is all we have as Monolith Games, producers of Conan and Batman, will be bringing Claustrophobia back. The 2009 ‘fight-against-demons’ dungeon crawler is a critical darling for its innovative mechanisms and head to head gameplay – and this new version features the original designer, tweaked gameplay, and all new miniatures. For those who might not want a huge mini-strewn box but still desire the tense versus experience of a holy war against the forces of hell, you can still get Claustrophobia and all its expansions in our store. Sparkle Kitty Nights is a sequel to Sparkle Kitty, a perfectly clean party card game for dirty minds. Nights introduces Knights in search of Princesses, a Dragon to fight co-operatively, and a slim price point of just twenty dollars. A space race for one to four players, CRR boasts solo, competitive, and co-op play as well as a sleek scifi art style. Rush to the planets before your opponents do – oh and do try not to get smashed by those meteors! A cooperative survival game in a cataclysmic world, with campaigns designed around all its player counts. Gather resources, fight bugs, and have lots of pretty miniatures in this euro-style game. 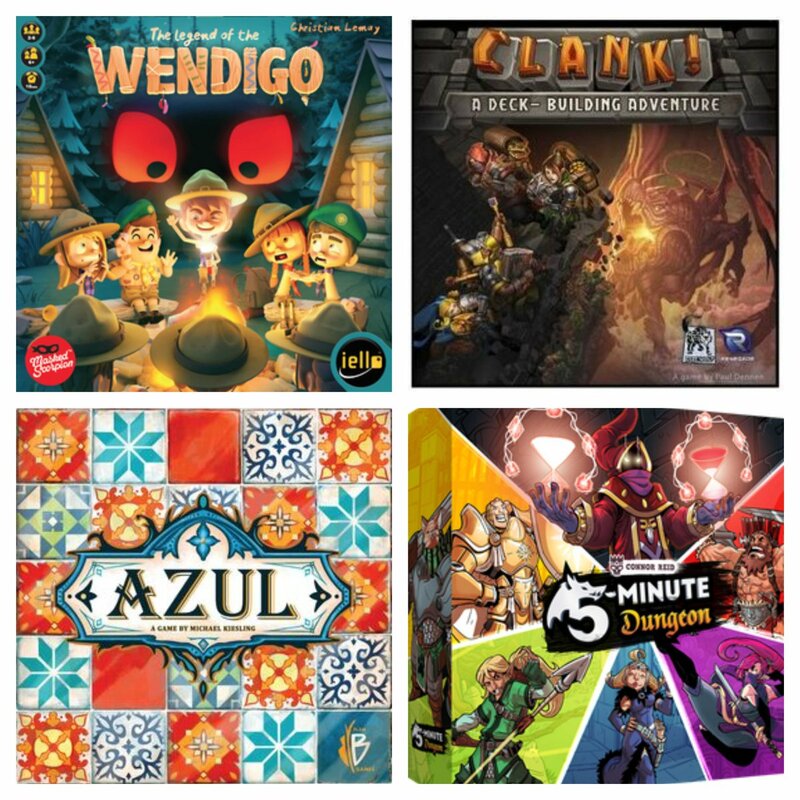 Spiel des Jahres Nominees announced! The most prestigious award in gaming has announced its chosen nominees, and we’ve gathered them all here! If you’ve had your eye on any of these… you should probably hurry. Games nominated for the SdJ tend to sell out very, very quickly. Reprints will obviously come through as these games gain buzz, but given the logistics of printing this may take anywhere up to a year, depending on how pre-booked the factories are. Don’t let your FOMO hit you on the way out and grab these games while you still can. Watch out later this week for our feature piece on all the nominees.